These are lean years for pickpockets. People carry more credit cards and less cash; men wear suits less, and tightfitting pants more. The young thieves of today have turned to high-tech methods, like skimming A.T.M.s. Notice how intimately the Internet is woven into the above cultural change: it’s throughout that particular cultural change. And the Internet (including music, video, Twitter, forums, news, blogs, and so on) is a perfect meme medium: enormous reach and rapid mutation and selection. And, as noted above, the ripple effects are enormous (cf. Ferguson MO, identified as a hotspot via Twitter). Whites, by contrast, can “brandish machine guns at the police”—as did supporters of Nevada rancher Cliven Bundy—without fear of reprisal. And it’s not just the police but the entire government that is arrayed against black Americans. Systematically denied equal access to education and employment, they are demonized when seek government benefits. in fact, the higher the black population in a state, “the lower that state’s social spending.” Ongoing white resentment of the civil rights movement that took away their privilege is the reason the U.S. is the only developed country in which a major party, the GOP, “wants to abolish the welfare state.” That party is also actively trying to change state electoral laws to diseenfranchise African-Americans. It isn’t just the police that must change—-it’s the entire culture. Very clear-sighted, I’d say—and note particularly this Kevin Drum post from today, regarding the last points. But the point is: things are shifting rapidly. That is, cultural values are not so insulated by distance and language and expense of travel as once was true: Internet again. So we’re in the midst of a major meme war, in effect, or—more appropriately—Cambrian Explosion of memes, evolving rapidly, exchanging patches of meme-DNA, and so on. Al-Qa‘ida is an idea rather than an organization, and this has long been the case. . . The truth—built on a basis of actual, stubborn facts—is by far the best and most reliable guide, even though it is disdained by most in politics and in organizations, all of which seem to include certain beliefs that must not be questioned or discussed—and the fact that these must not be discussed is also not open for discussion. A study of the figures presented by the media and politicians to illustrate “irrational” criminality during the 2011 riots in the UK tells a similar story. The statistics used to describe these events were often selective or misrepresented and the conclusions drawn were not . . . The soap is a freebie that I agreed to test. Note the ingredients. It’s a softer soap, along the order of Wickham, and it lathered very nicely with Mr. Pomp, the brush. Tin is a nice size, and on a whim I tried palm lathering, and that worked well. Next time, though, I’ll face lather for the sake of variety. The ATT H-1 with an Astra Superior Platinum blade did an easy, three-pass shaving producing a BBS finish. 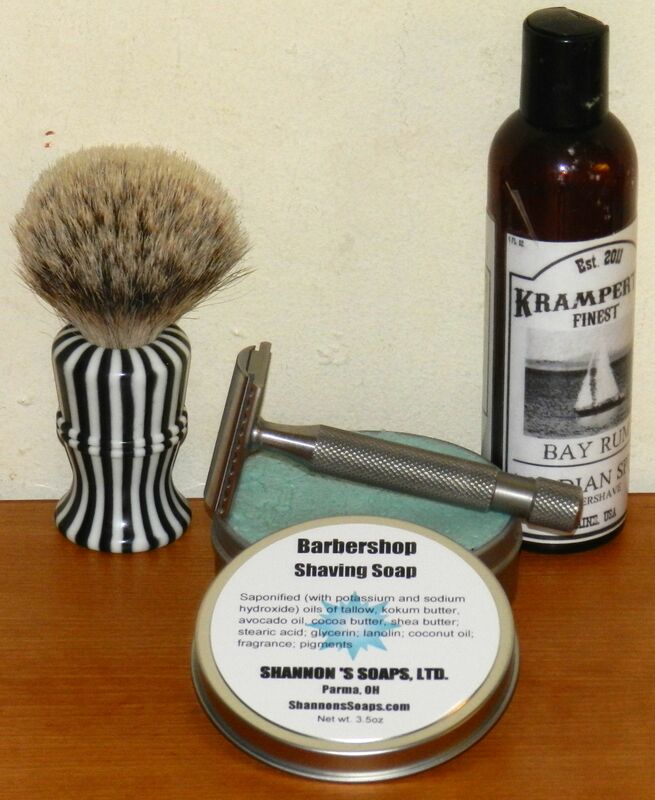 A good splash of Krampert’s and Friday begins.